A little bit of twinkle is always a good thing in my opinion. Whether it is a twinkle in someone’s eye when they smile, a twinkling star in the sky, or an abundance of twinkle light charm for Christmas. Twinkling trees and garlands add the perfect amount of ambiance indoors. And outdoors, they feel just as magical. 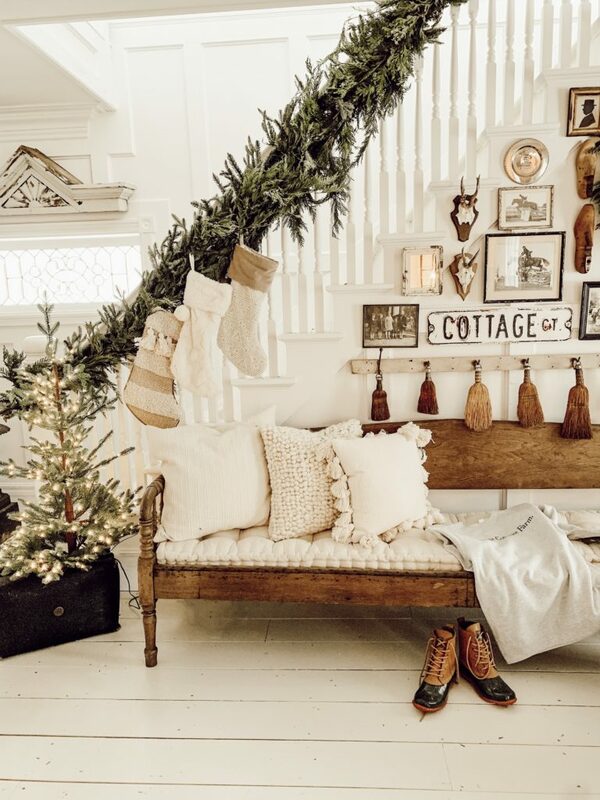 With garlands and wreaths on doors, porches, and outdoor seating areas decorated for the holidays, there are so many places to add an extra sprinkle of magic this season. Today I am sharing a few ideas that you can incorporate into your own home. No white Christmas where you live? If snowmen and sleighs are scarce in your area, highlighting your outdoors with a fresh, green look is a great way to get into the holiday spirit. 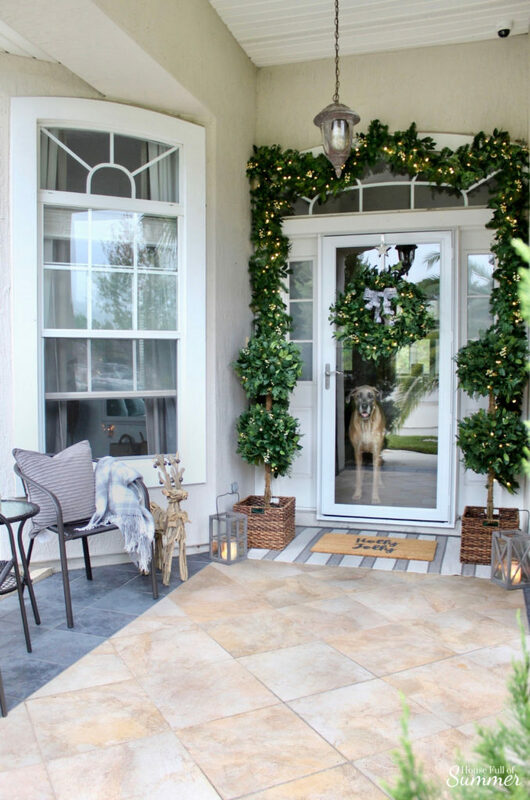 Jessica of House Full of Summer shows us how she decorated her front porch for Christmas in Florida’s warm, sunny climate. Debbie Macomber’s widely beloved Christmas novels are an endearing expression of her love for the season. Likewise, her message of family, friendship, and joy shines through in the way she prepares her home for the holidays. 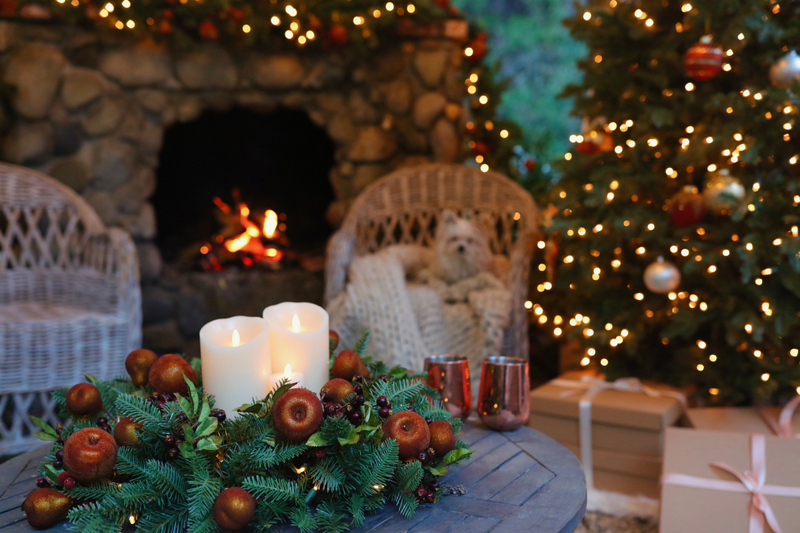 In this video, Debbie shows us how her own family decorates for and celebrates the most wonderful time of the year. This time of year it’s all about greening up every area of our home. Well, at least that’s how it is here on our farm. This holiday season, you can make a meaningful difference with your likes, comments, and shares. Join Balsam Hill’s “A Charitable December” campaign and help share the joy of Christmas with our three partner organizations. Some people put up their Christmas décor as early as November 1st, while others make it a tradition to decorate right after Thanksgiving. Sometimes, however, the question isn’t “when” but rather “where” to start decorating. Here are four ways to get you started, with a little help from a few of our decorator friends. Jamie of Whitetail Farmhouse chose a vintage look for her outdoor décor. 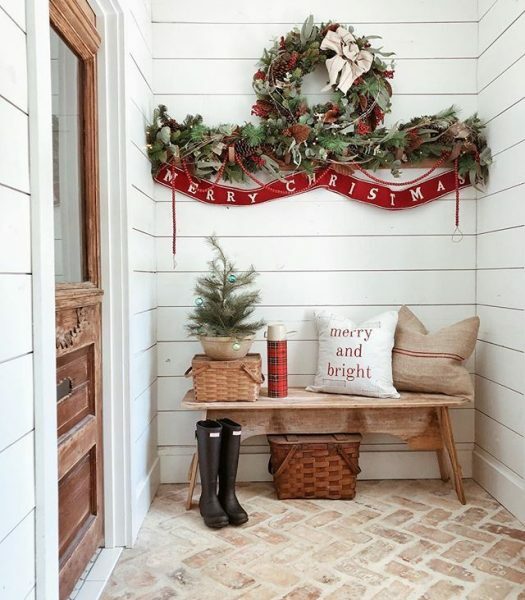 She hung a matching wreath and garland set and added a classic red Merry Christmas ribbon to brighten the space. 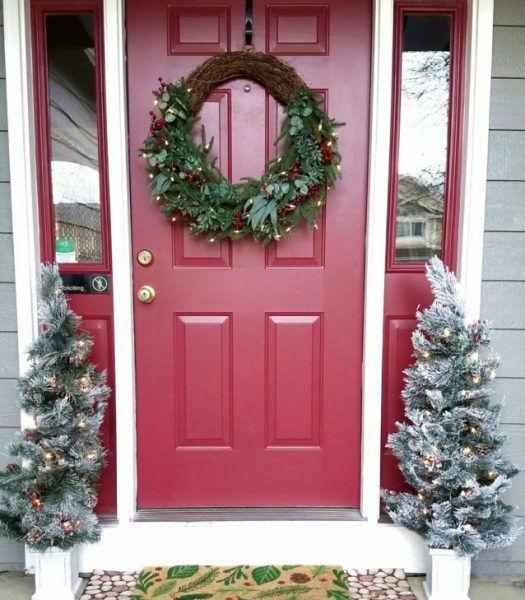 Jackie of Rocky Mtn Momma started with a wreath to make her red door even more festive. She chose a pre-lit wreath, so her doorway looks as welcoming even at night. 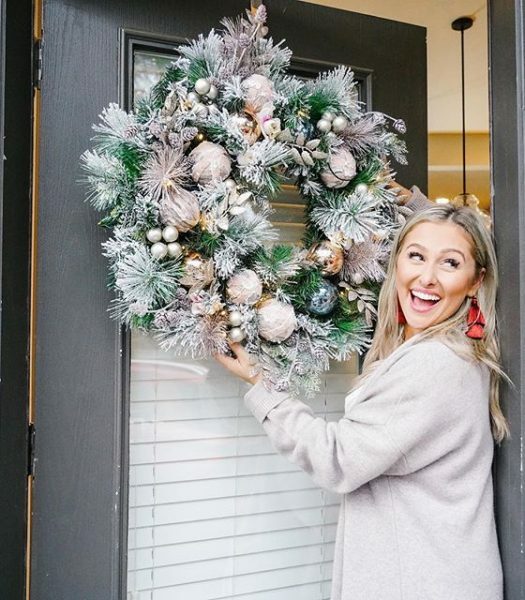 To begin her holiday decorating, Mallory Ervin hung a festive wreath on her door. 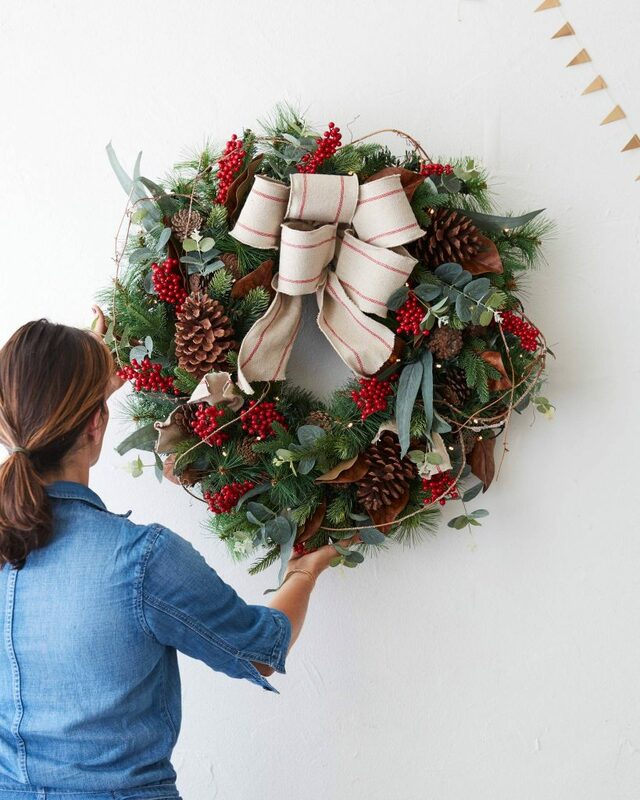 A wreath or garland—or both—on the front door or any entryway is probably the easiest way to get you in that holiday decorating mood. Visit Jamie of Whitetail Farmhouse, Jackie of RockyMtnMomma, and Mallory Ervin to see more. Wreaths and garlands complete the look of any Christmas décor, but that often means making holes on walls, doors, or mantels. To help you with this dilemma, we’ve compiled five ways to hang your greenery without leaving any permanent damage. 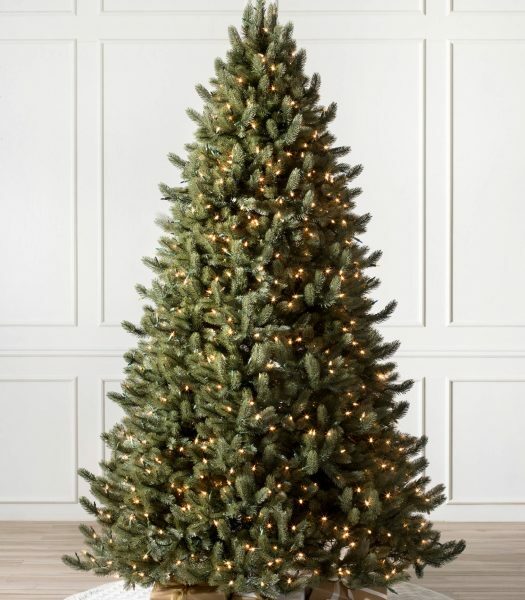 Fir, Spruce, and Pine are the three most popular Christmas trees. Learn the distinguishing features of each and how to know the difference in this short guide. 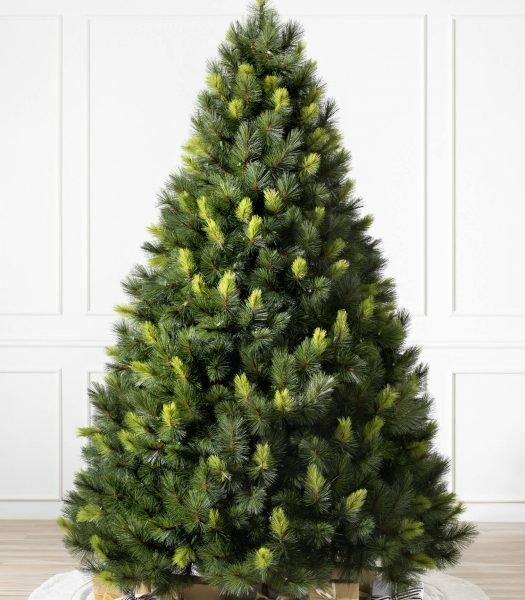 The BH Balsam Fir has a teardrop shape, layered top, and thick foliage ideal for lesser amount of decor. 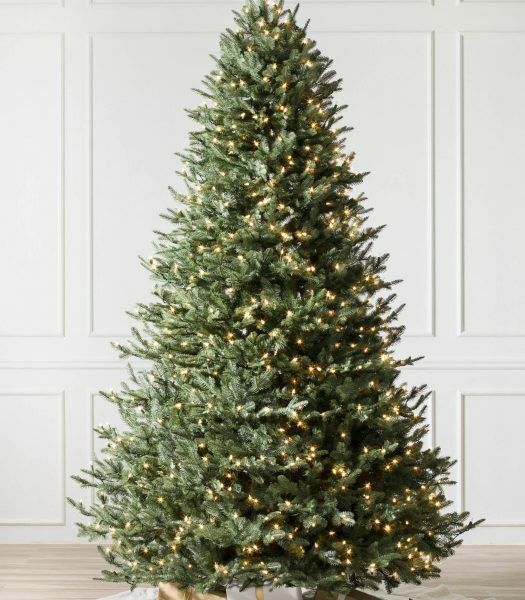 The Vermont White Spruce has a full, generous silhouette with long needles and distinct upward-sloping branches ideal for holding bigger ornaments. The Scotch Pine has a full profile with wide-spaced branches to prominently display decorations. To start, they’re called evergreens because instead of leaves, they have close-set needles that normally stay green year-round. Specifically, they’re coniferous evergreens, which means they produce cones that contain the plants’ seeds. Hosting Thanksgiving dinner can be rewarding and daunting at the same time—you have to plan the menu, cook, and decorate the table. We may not be able to help with the turkey, but we can give you three ideas to create a stunning tablescape to impress your guests. 1. Use fall fruits and foliage. For Liz Marie of Liz Marie Blog, one statement piece is enough. She kept it simple with an Apple Spice Garland as the centerpiece and complemented that with DIY apple place cards. The set-up is a blend of colorful fall fruit and foliage that look like they’ve been picked straight from the farm. The rich tones of the décor add to the warm and rustic ambience of their dining room. A holiday swag full of festive greenery, berries, pinecones, and a pretty ribbon is a simple way to add a touch of Christmas to your home. Of course, a swag is perfect for a front door or mailbox—but what about some of the other areas of your home if you want to try something a bit different? 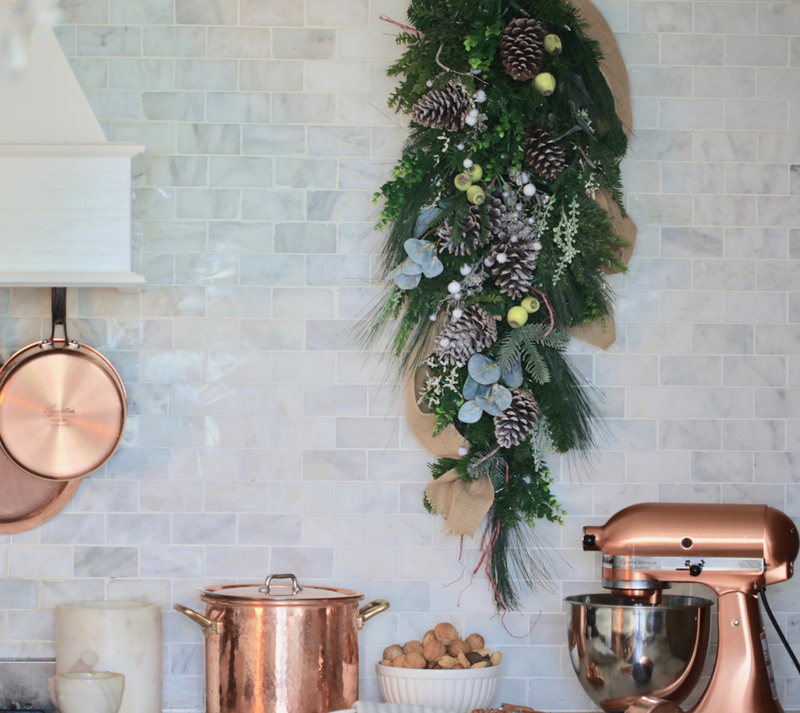 Today I am sharing 4 ideas on where to hang those gorgeous holiday swags to add the perfect amount of holiday cheer to your home.